At Heart Bingo you can enjoy plenty of games and additional promotions. There is so much to do here that you can’t not have a good time. PLAY £10 GET UP TO £50 FREE BINGONew Customer Offer. T&Cs Apply. 18+. Please Gamble Responsibly. If you love bingo, you are sure to love this site. 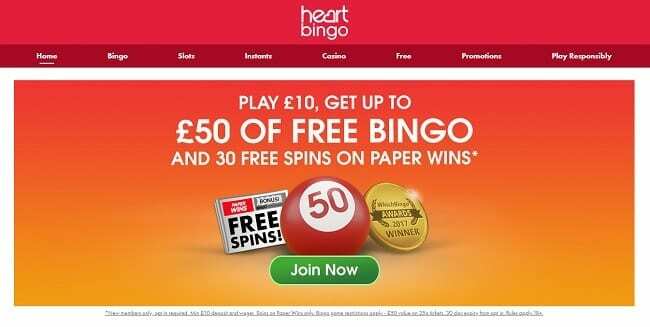 Sign up to Heart Bingo today for the best games and promotions. It’s one of many popular Gamesys bingo sites which you can find online. We are sure you are going to love the site. Why not have a look around our Heart Bingo review now and sign up today? There are many bonuses that you get with a Heart Bingo promo code in April 2019. Players can receive a fantastic bonus when they first sign up. If you want to try out the site, make sure to fill in your details now. The brand loves to treat its players. You can find hundreds of promotions every month. Some of the past giveaways include brand new cars, family holidays and Spa breaks among others. There are plenty more promotional deals available at the site so make sure you keep an eye out to see what’s coming up each week. We think this is great as it’s important to reward regular players just as much as new people signing up. Free Bingo week and Daily BOGOF give players an opportunity to play their favourite games at a bargain. There is also the daily free game where players can play for free spins on the Double Bubble or real cash prizes. If you want another site with a similar welcome offer to this one, have a look at our Bingozino review to see what we thought of this brand. The homepage that you’ll see with your Heart Bingo login has a red and white colour scheme. The layout of the site is simple and easy to understand. It works pretty well with direct link to all of the different types of games on the site. Games are prominently displayed just underneath a scrolling banner detailing all the current offers and promotions. You can see the value of the progressive slots jack points on the right side of the software. Another exciting feature of this site is the ability to listen live to the radio as you play. Registering to the site will only take you a few minutes. You will be asked to give details such as name, email address, username and password. You can bypass the monetary part and proceed to check other features of the game. Heart Bingo has different types of games to suit every player. You will find four tabs in the lobby; Free, Instants, Slots and Bingo. You can choose to play the 80 ball, 90 ball bingo, Super Snap, Bingo 75 along with a selection of slots of instant games. The site does not have a wide choice of Bingo rooms. However, the few rooms available allow all players to congregate in those few rooms, resulting in higher jackpots. Heart Bingo has a mobile app that you can use to play a few games on your mobile device. Some of the games that you can play using this app include Double Bubble, Tiki Island and Winstones. On the downside, the mobile app doesn’t have chat rooms. Check out our review for Bid Bingo to see another site with mobile-friendly features which you can use on the go. If you are looking for a fun and friendly vibe, then heart games is the place to play. Heart Bingo is known for its welcoming community, wide choice of Bingo and generous giveaways, slots and instant giveaways. The variety of games on this site gives everybody a chance to enjoy and win great. Overall, we think you are sure to love Heart Bingo. The site offers great games, features, promotions and more. If you wish to sign up with the Heart Bingo promo code for April 2019, make certain to click on the button on this page.